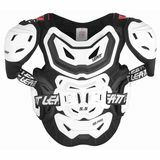 WTN901 - Illinois Very pleased "My 10 year old son is using this chest protector in conjunction with his GPX 5.5 Junior neck brace. The neck brace nests very nicely in the cutouts in the chest protector. Love how this chest protector can be worn under the jersey and neck brace over the jersey. It's a bit heavier than the chest protector he wore previously, but I attribute that to the quality materials it's made of. He says it's very comfortable, and does not hinder his riding." GEETT IIIT - Sulphur, Louisiana Awesome product "I bought this afew months ago and I really like it. It has so much more protection than all other protectors. In all the other reviews I read people said the shoulder pads weren't removable. They are wrong completely removable if you desire. I have had a few spills since purchase nothing real bad, but I feel my ribs stand a much better chance now against handle bars or whatever with this protector. 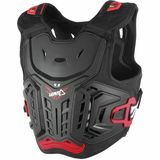 Definitely a must have for a higher level of protection."